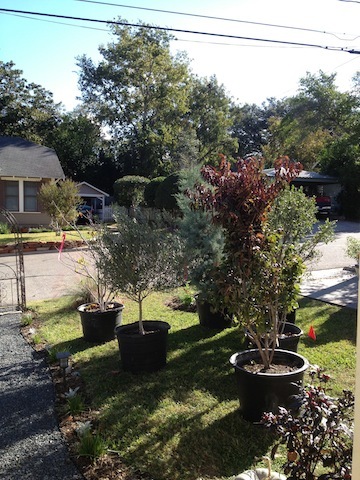 Trees in 30-gallon buckets, awaiting planting. There used to be a joke about things being so slow you could see the grass grow. It doesn’t really apply in Texas, where during the summer we have to mow about once every two minutes to keep the St. Augustine from enveloping the house. 2 Arizona cypress, 1 olive, 1 Mexican buckeye, 1 Texas persimmon – gorgeous shape!, 1 roughleaf dogwood, 1 yaupon holly, 1 fig, 2 ‘Crepuscule’ roses and 18 ‘Martha Gonzales’ roses. The next day, her crew planted them. She helped us place them and thought we needed one more cypress – so it came a day or two later. Almost immediately, I could see the need to move some plants and small beds I’d thrown into the landscape earlier this fall because I just had to get something into the ground. 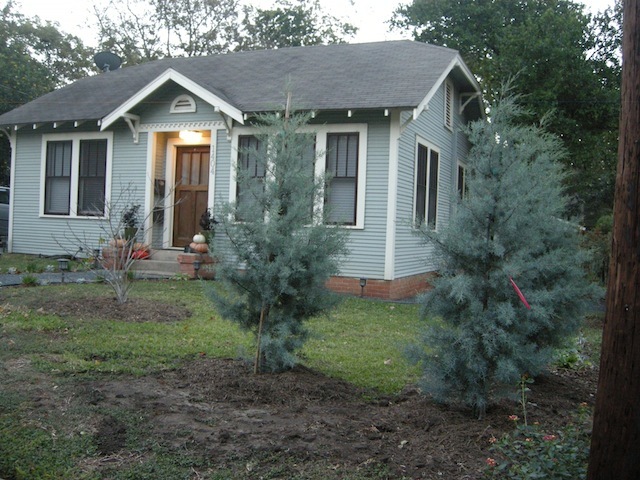 Arizona cypress is like a small blue spruce. I believe this gorgeous, weepy-limbed variety is “Carolina sapphire,’ and they should be about twice this large in five years or so. Given the color of the house, how could we NOT have them? 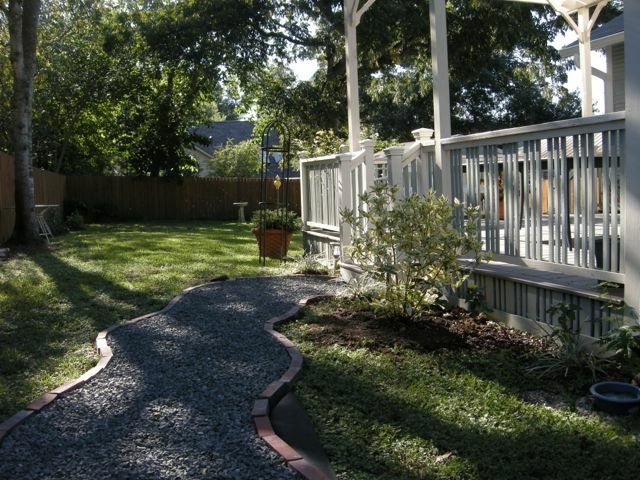 In this corner of the front yard, they will also help block the view of a busy street at the end of our block. The trees turned out to be the easy part. About a ton and a half of stone, ready to line a new bed. 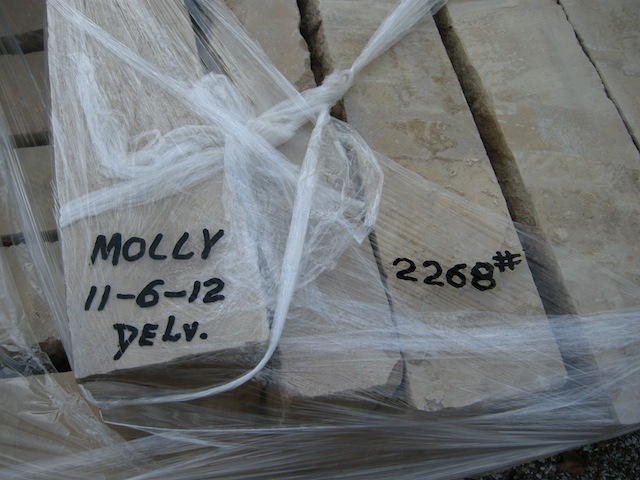 When a palette of stone has your name on it, better get the epsom salts ready. 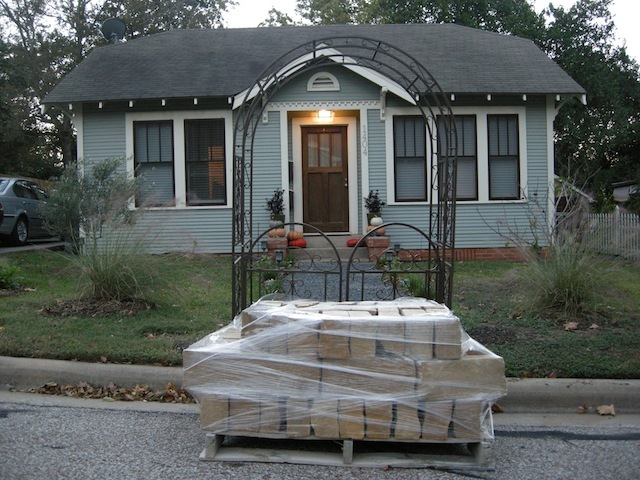 2,268 pounds of 6-inch thick Lueders Caramel Tan Wet-Sawn Limestone. I pride myself on being quite the stone slinger, but Don had to do most of these. Very heavy. ‘Marthas’ in place, lined up like chorus girls. Ah, the satisfaction when you’re done, of putting plants into well-prepped soil. Underneath all the weeds in our lawn is the most lovely sandy loam you can imagine. 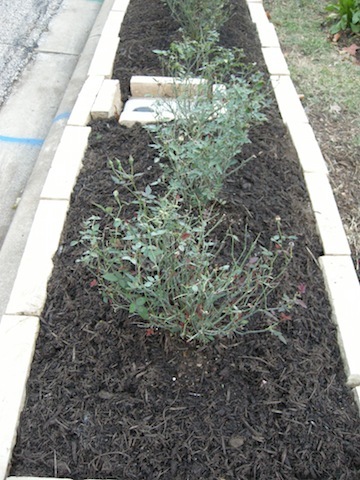 We plumped it up for this bed with 10 bags of Lady Bug Rose Magic Mix, then topped it off with five bags of native hardwood mulch. Bring on the next project. If you have been paying attention, you may notice some things missing now: New Plough & Hearth arbor, removed to the back yard for some other use; the stakes on it were too short to secure properly out here, given the downward slope of the yard – not from front to back but south to north – and the conundrum we created with the limestone edge of the rose bed. Also gone: Those beautifully blooming Lindheimer muhly grasses, moved to a spot at the left back corner of the front yard. Soon to go: A silly round bed featuring the David Austin rose ‘Jude the Obscure,’ bought on impulse because a single bloom seduced me. 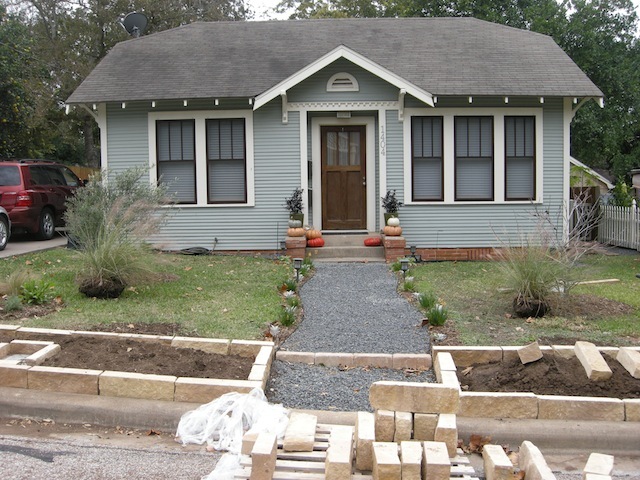 Soon to come: Daffodils and spring annuals to spill over the limestone edging, which looks a little too formal right now – like it’s in need of a Tuscan McMansion. This entry was posted in Garden and tagged 'Martha Gonzales', Arizona Cypress, garden, landscape, Limestone, Mexican Buckeye, Olive, patience, Texas Persimmon, trees, weeds, Yard on November 13, 2012 by Molly Glentzer. That pile of gravel has officially been cleaned from the driveway. The last of it went to creating a path from the south-side gate to the deck. Now, if those weeds could become a garden as quickly. Moved a variegated gardenia from a pot to the ground just to make it look like we’ve started something. What I know right now: Everything in this area of the yard will have white blossoms so it can be enjoyed from the deck in the evenings. We are so anxious just to get things in the ground we have begun a very bad habit of not properly prepping beds before we plant. Biggest problem: I keep picking up this and that at nurseries, then need to get it out of the plastic and into the soil. The current philosophy: Dig out all the weeds and what little St. Augustine might still be alive there; throw in some Lady Bug Revitalizer Compost or similar product, plant high and mulch like hell. Borders, if we ever figure out what they will be, will come later. The little bricks holding the gravel in place were about 40 cents each at Lowe’s – a Sunday morning score. 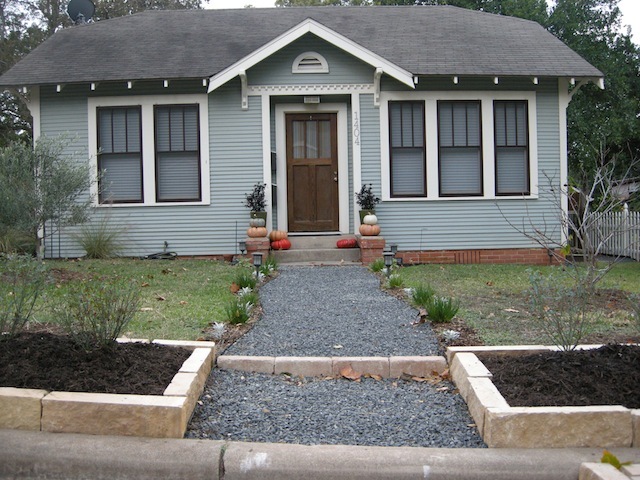 This entry was posted in Miscellany and tagged garden, gravel, walk, weeds on October 9, 2012 by Molly Glentzer.